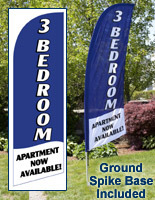 This apartment rental flag for 1-2 bedroom is a great tool for realtors who want to sell rooms fast, without spending a ton on advertising. 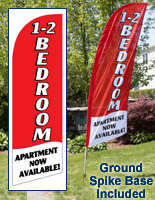 This swooper banner with a high-contrast color design has a horizontal message beneath the vertical one, which says, "APARTMENT NOW AVAILABLE!" to emphasize excitement and urgency. 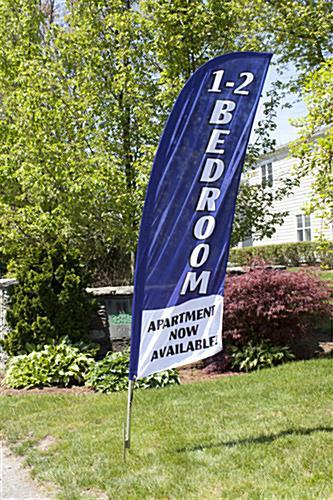 This rental flag for 1-2 bedroom is visible from the road, due to the blue background with easy-to-read white lettering that really pops. The knitted polyester fabric holds up to wind and rain, and when pulled taut over the bungee cord, achieves the classic flutter effect. 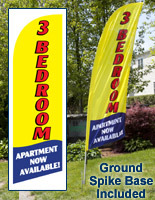 This flag for 1-2 bedroom measures eight feet tall and features a sliding pole and steel ground spike that easily pokes into green grass and dirt. 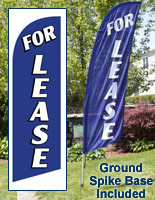 Portable, great looking, and affordable - feather signage is a reliable way for property managers and agents top sell, fast! 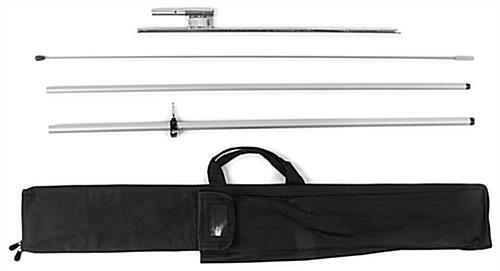 Plus, the sign comes with a black nylon carrybag with separate compartments to organize the 2 aluminum and 2 fiberglass pieces that comprise the adjusting pole. Setup is user-friendly and time-efficient. This setup will fit easily into a truck or car to be transported back to the office, or to a new property. Shop this item in other colors at this website. Quick, one person assembly - Watch Video! Please Note: These banners are not for use in winds exceeding 10 mph.